Strictly's Kevin Clifton has confirmed he's going to be a judge on ITV special All Time Musicals. 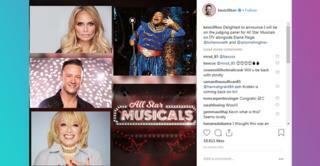 He announced the news on his Instagram page saying "Delighted to announce I will be on the judging panel for All Star Musicals on ITV alongside Elaine Paige, @kchenoweth and @astonishingtrev,"
The show will be hosted by former I'm A Celebrity contestant and Doctor Who star, John Barrowman - who's also performed in lots of musicals. Kevin's co-judges are legendary musical theatre actress Elaine Paige, award-winning theatre, TV and film actress Kristin Chenoweth and actor Trevor Dion Nicholas who most recently played Genie in the London production of Aladdin. The new show starts in the Spring and will see seven celebrities performing famous musical theatre songs in the West End in front of a live audience. But what about Kevin's future on Strictly Come Dancing? Kevin's been on Strictly for 6 years. He's been in four Finals and came 7th with partner Susan Calman in 2017. But 2018 was his year, and he won with Stacey Dooley. Go Kevin! So will he make a triumphant return in 2019? Or will he leave the show while he's at the top? A Strictly spokesperson told Newsround "The professional dancer line up for 2019 will be announced in due course." Strictly Come Dancing: What do the stars REALLY think of each other?